If you get errors, Make sure your game is properly installed. Depending on your architecture. A ‘String Value’ called “Install Dir” must reside there for this tool to work. In my case this is: “C:\GAMES\Burnout(TM) Paradise The Ultimate Box\” if you get errors, Make sure this key exists. Added Raptr and Steam contacts to About dialog. Added clickable Raptr profile link to main window. Added readme.txt regarding errors you may encounter. Fixed settings path detection for XP! Updated cleanup code to reflect temporary file name change. Chat is only partially featured. May require a few libraries now, All available from Microsoft. Improved detection of Menu Music and No Intro fixes. Better handling of backup files for Menu Music and No Intro. If you applied Menu Music or No Intro fixes and saved settings more then once, Your backups got overwritten with backups of the modified files. You can find these files on the CD or they would be about 18mb to download. I’ll write a script to extract and install these if you need them later today. Added option to change background! Added option to change text color! Updated default, min and max values. Changed output of Config.ini, Should keep untouched settings now. 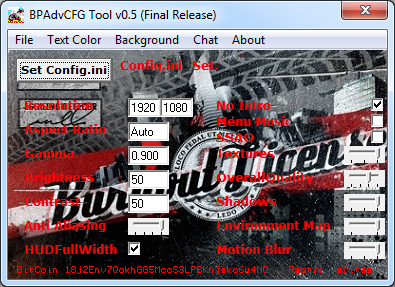 Added Launch Burnout Paradise button to File menu. Debug Release, Write Functions disabled. M$ changed their first link slightly. I’ve just updated it. MSCOMCTL.OCX is Microsoft Common Controls. It should be available at the 2nd link.